Regular running makes people happier and more confident in everyday life, according to research. Academics said a survey of 8,000 runners found they enjoyed a sense of satisfaction and achievement, with social networks such as parkrun and Strava adding a sense of community. The vast majority of those surveyed - 89% - said running regularly has made them happier and has had a positive impact on their mental health and body image. The runners surveyed scored 4.4 on the Oxford Happiness Scale, above the average score of 4 on the method used by scientists to measure well-being. Dr Emmanuelle Tulle, reader in Sociology at the university, said: "Running gives you a feeling you have achieved something and a sense of tremendous satisfaction. "It adds to a general sense of well-being, you feel good and it helps boosts your self-confidence. "The combination of attending parkrun and being able to track your progress on Strava makes runners feel as if they are not on their own, it enables them to see the point of running. "They are much more likely to maintain regular exercise as a result and reap the benefits. "There is a combination of competitiveness and togetherness, which is extremely beneficial." The survey found 83% felt more motivated to exercise through using the Strava app while 55% said taking part in parkrun had a positive impact on their social life. Meanwhile, a separate study published in the American Journal of Psychiatry found that engaging in physical activity decreases people's chance of developing depression. An international team of researchers, including experts from King's College London, examined data from 49 different studies which included information on depression and physical activity. In total, data concerning 266,939 people were included in the analysis. Compared to people with low levels of physical activity, those with high levels of activity had lower odds of developing depression. 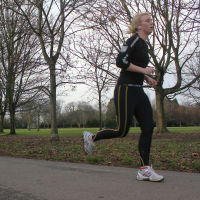 "Our robust analysis of over a quarter of a million people found consistent evidence that people who are more active are less likely to develop depression in the future," said study co-author Dr Brendon Stubbs, post-doctoral research physiotherapist with the Institute of Psychiatry, Psychology and Neuroscience at King's College London and head of physiotherapy at South London and Maudsley NHS Foundation Trust. "We found that higher levels of physical activity were protective from future depression in children, adults and older adults across every continent and after taking into account other important factors such as body mass index, smoking and physical health conditions.